The third part of the Old Testament canon, the other two being the Law ( ) and the Prophets ( ). It includes the three books (Hebrew initials of ), which in a special sense are designated as the poetic books par excellence, Job, Proverbs, and Psalms; the five Megillot ( = "rolls"), which are read on five different festivals, and which include Canticles, Ruth, Lamentations, Ecclesiastes, and Esther; the books of Daniel,Ezra-Nehemiah (considered as 'two parts of one book), and Chronicles—eleven books in all. The order of the Hagiographa in the Talmud is as follows: Ruth, Psalms, Job, Proverbs, Canticles, Lamentations, Ecclesiastes, Daniel, Esther, Ezra, Chronicles (but see "Halakot Gedolot," ed. Hildesheimer, p. 633). The first place was given to the Book of Ruth on the ground, probably, not only that it contained an episode in the history of the house of David, but also that the genealogy at the end of the book, reaching down to David, was a suitable introduction to Psalms, ascribed to David. The Book of Job followed the Psalms because, on the one hand, the three great hagiographs should be grouped together, and, on the other, Proverbs should not be separated from Canticles, both being ascribed to Solomon. Ecclesiastes was for the same reason placed with the earlier books; and the three later books, Esther, Ezra, and Chronicles, were placed after Daniel because it was assumed that the latter was written earlier (by Daniel himself) at the Perso-Babylonian court. This sequence is found in different manuscripts, with the exception that in some, Proverbs immediately precedes Job, or Canticles precedes Ecclesiastes, and Esther precedes Daniel. The sequence differs among the Masoretes, who, according to Elijah Levita ("Massoret ha-Massoret," p. 120; ed. Ginsburg, p. 67), follow the Sephardic arrangement, which is as follows: Chronicles, Psalms, Job, Proverbs, Ruth, Canticles, Ecclesiastes, Lamentations, Esther, Daniel, Ezra. The German manuscripts give another sequence: Psalms, Proverbs, Job, the five Megillot, Daniel, Ezra, and Chronicles, the five Megillot following the order in which they are now read in the synagogue—Canticles, Ruth, Lamentations, Ecclesiastes, Esther. Many other variations, however, are found in the different manuscripts. The sequence of the Hagiographa in the Alexandrian canon must also be mentioned, as it not only differs from the Jewish canon in the order of the several books, but also includes a number of works not recognized as canonical in Palestine. Here the Book of Ruth follows Judges; I Ezra and II Ezra (Ezra and Nehemiah) follow the Chronicles; and Esther follows the apocryphal Tobit and Judith, which follow I and II Ezra; of the other books, Job, Psalms, Proverbs, Ecclesiastes, and Canticles, as the specifically poetical books, are placed together; Lamentations is an appendix to Jeremiah (between Baruch and the Letter of Jeremiah); and the Book of Daniel follows, and ranks with, the three greater prophets. Through the Vulgate this sequence was, on the whole, adopted by Luther in his Bible. The existence of the Hagiographa collection as a third part of the canon is first stated in the prologue (about 130 B.C.) to Sirach, with which the translator and grandson of the author of Ecclesiasticus prefaced his Greek translation. At the very beginning mention is made "of the many and important things which were transmitted to the Jews through the Law, the Prophets, and the others that followed them." There is no doubt that in this summing up of the Old Testament literature the authors of the Hagiographa are meant by "those that [κα= "as authors"] followed the Prophets." A confirmation of the fact that this Hagiographa collection ranked even then with the older books of the canon is found in a passage in I Maccabees (vii. 17; written probably 100 B.C. ), where two verses of a psalm (lxxix. 2-3) are quoted as Holy Scripture; and as all the books of the Hagiographa as now known date back at least to the second half of the second century B.C., it may be inferred that the collection included even then—that is, in the beginning of the first century B.C.—the same books as now, with the exception, perhaps, that single detached portions may have been added later. Again, it is known that the canonicity of certain books of the Hagiographa was disputed—Canticles, Ecclesiastes, and Esther. 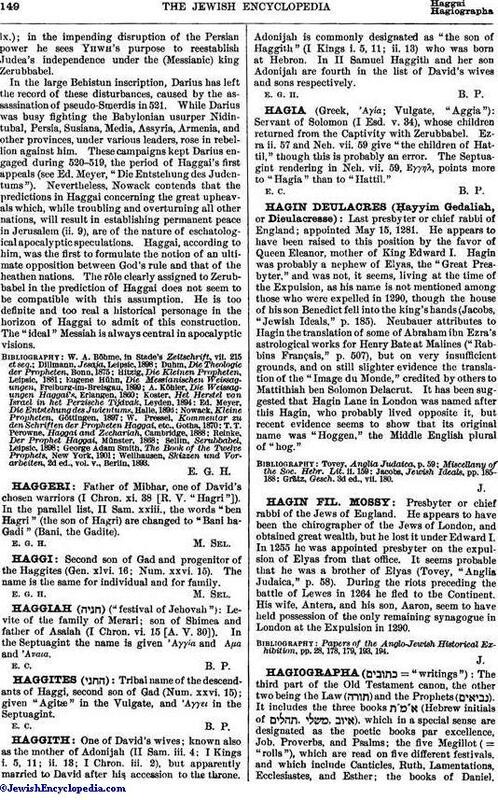 The canon, including, of course, the Hagiographa, was defined at the Synod of Jabneh about 90, the point at issue being not the admission of new books into the canon, but the exclusion of certain books—Canticles, Ecclesiastes, Esther, Proverbs, Ruth, and even Ezekiel, books that had already been included, but that were deemed by some unworthy of that position. 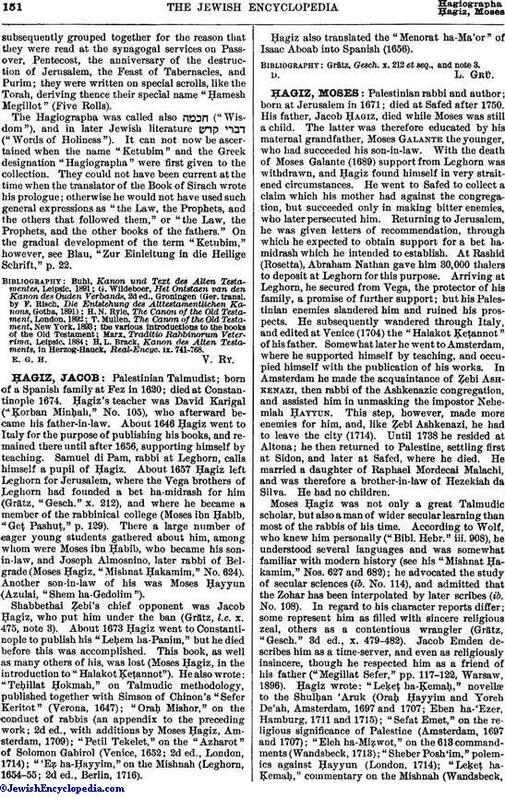 The energetic advocacy of Akiba in behalf of all the books, and the fact that the Mishnah recognized the twenty-four books as of equal canonicity, finally decided the issue. Another point to be considered is the gradual growth of this collection. 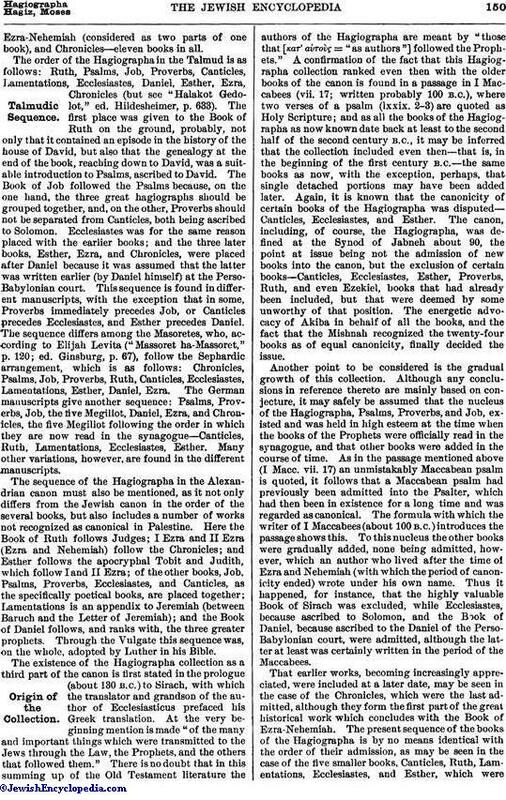 Although any conclusions in reference thereto are mainly based on conjecture, it may safely be assumed that the nucleus of the Hagiographa, Psalms, Proverbs, and Job, existed and was held in high esteem at the time when the books of the Prophets were officially read in the synagogue, and that other books were added in the course of time. As in the passage mentioned above (I Macc. vii. 17) an unmistakably Maccabean psalm is quoted, it follows that a Maccabean psalm had previously been admitted into the Psalter, which had then been in existence for a long time and was regarded as canonical. The formula with which the writer of I Maccabees (about 100 B.C.) introduces the passage shows this. To this nucleus the other books were gradually added, none being admitted, however, which an author who lived after the time of Ezra and Nehemiah (with which the period of canonicity ended) wrote under his own name. Thus it happened, for instance, that the highly valuable Book of Sirach was excluded, while Ecclesiastes, because ascribed to Solomon, and the Book of Daniel, because ascribed to the Daniel of the Perso-Babylonian court, were admitted, although the latter at least was certainly written in the period of the Maccabees. That earlier works, becoming increasingly appreciated, were included at a later date, may be seen in the case of the Chronicles, which were the last admitted, although they form the first part of the great historical work which concludes with the Book of Ezra-Nehemiah. The present sequence of the books of the Hagiographa is by no means identical with the order of their admission, as may be seen in the case of the five smaller books, Canticles, Ruth, Lamentations, Ecclesiastes, and Esther, which weresubsequently grouped together for the reason that they were read at the synagogal services on Passover, Pentecost, the anniversary of the destruction of Jerusalem, the Feast of Tabernacles, and Purim; they were written on special scrolls, like the Torah, deriving thence their special name "Ḥamesh Megillot" (Five Rolls). The Hagiographa was called also ("Wisdom"), and in later Jewish literature ("Words of Holiness"). It can not now be ascertained when the name "Ketubim" and the Greek designation "Hagiographa" were first given to the collection. They could not have been current at the time when the translator of the Book of Sirach wrote his prologue; otherwise he would not have used such general expressions as "the Law, the Prophets, and the others that followed them," or "the Law, the Prophets, and the other books of the fathers." On the gradual development of the term "Ketubim," however, see Blau, "Zur Einleitung in die Heilige Schrift," p. 22. H. L. Brack, Kanon des Alten Testaments, in Herzog-Hauck, Real-Encyc. ix. 741-768. E. G. H. V. Ry.